Wow! This looks completely tricky, but very alluring to try! My skein of trying is coming out of my basket for this one! Hi all! I have been lookong for pattern that will match this stitch. I am knitting a baby blanket, and have done 8 rows with the anemone stitch. 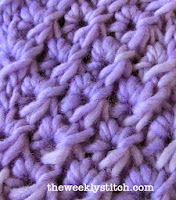 I want to alter this stitch with another one but I don't know one that will suite it. Could someone maybe advise me about it?? Thanks so mutch!